In the just-concluded Italian election, the big loser was Mario Monti. The outgoing Prime Minister only garnered 10% of the vote, which has to be one of the worst showings for any incumbent in the history of elections.Monti came into power in late November 2011, when surging national borrowing costs resulted in the ouster of Silvio Berlusconi. Monti — a favourite of bankers and the ECB — instituted reforms (cutting pensions, raising taxes) that were very unpopular, but got high marks from other European leaders. 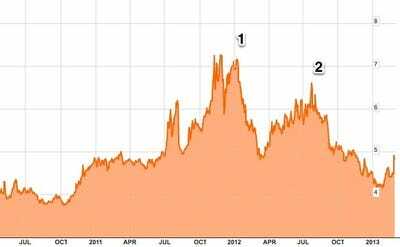 But during Monti’s tenure there has been a huge drop in Italian borrowing costs. So as Monti prepares to leave the stage, the perspective of European elites is: Well, he heroically did the tough, unpopular choices that were necessary to restore confidence. Here’s the problem: There’s no evidence that Monti’s reforms did anything to establish confidence or reduce borrowing costs. Here’s a look at 10-year borrowing costs for Italy, going back the last 3 years. Italian borrowing costs had two distinct peaks. The first peak, in late 2011, was assuaged when the ECB announced its 3-year LTRO program, which was a backstop for the banks. The second peak, in summer 2012 came when ECB chief Mario Draghi made his famous “whatever it takes” comment about saving the Eurozone. Draghi would go on to establish the OMT program, whereby the ECB would backstop sovereign bonds, provided that the countries requested aid and agreed to austerity. So it’s true that Italian borrowing costs have come down, but it’s very clear why: The work of the ECB, backstopping both banks and sovereigns. 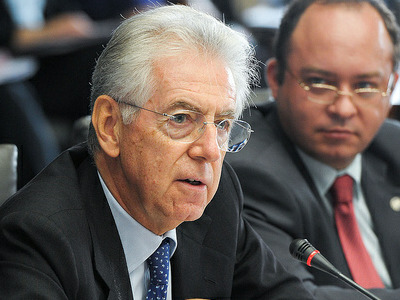 There’s no evidence that Monti’s confidence-inspiring reforms have accomplished anything. Certainly looking at the situation in the private sector, there’s no evidence that Monti’s confidence creation has done any wonders for Italian corporate activity. But this is the lie they keep telling themselves in Europe. They all talk about making these hard choices, to get back in the graces of the market. But the only thing that works is the unlimited backstop of the ECB.